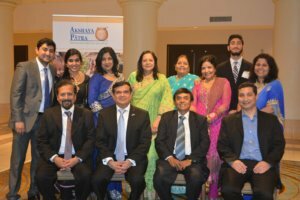 The Consul General of India in New York Sandeep Chakravorty was the chief guest at the gala. Also in attendance were Padma Shri Dr. Sudhir Parikh, founder and chairman of Parikh Worldwide Media, and his wife Dr. Sudha Parikh. Vanadana Tilak, the CEO of Akshaya Patra, shared a compelling presentation about the organization and its mission, which is to feed five million children by 2020.